We updated our choices for best scuba gear set on the market. It is tough to know what a good set of snorkeling equipment is? From the true beginner of never even putting your face in the water to see the beautiful ocean or being in the water half the year enjoying all the world has to offer, this is where we will decipher the good from the bad and the cheaply made, and to the expensive sets that you probably don't need. Finding the right set that fits your face properly with good skirting (seal around the mask), fins that won't give you blisters and a snorkel that will fit comfortably in your mouth so you can have a great day and not be bothered by any unnecessary issues that may arise. When you have no idea what to look for and how everything should feel it is tough to make a budget conscience decision on buying something that you may only use once. I was in that situation and I figured I could just use some that they had at the shop in Honolulu... I was really wrong. First of all, the guy at the rental shop either had no idea or he just didn't care. He told me how to fit my mask, and it seemed not to fit right but he said it was fine and myself none the wiser thought he must be right. As I proceeded to put the fins on I asked the store keeper if this would rub against my foot while I was in the water and he said it never does. Needless to say, you know where I am going with this and my feet blistered, along with my leaky mask. After thorough research that night a couple days later I was able to buy my own gear for a reasonable price that has worked for years now. Seavenger Adult and Junior sets. Includes open heeled fins, snorkel with splash guard. Single tempered glass mask with silicon skirting and carrying bag. Great value for your first set to get you in the water and come in many colors! Phantom Aquatics set gives you more options with open heeled fins with adjustable strap. 2 Pained tempered glass lens and silicone skirting for a leak proof swim. Semi dry top valve to prevent water entry and comes with a mesh bag so your gear will dry faster. 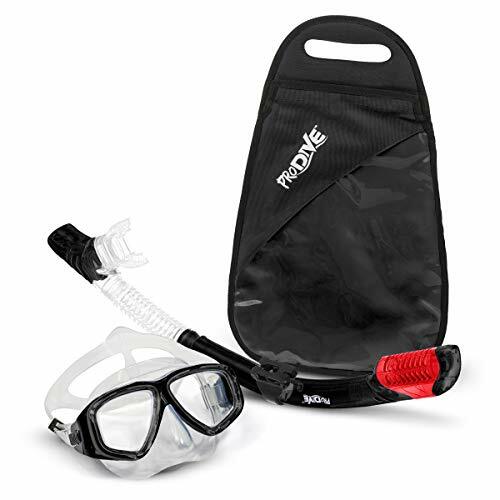 Promate Snorkeling gear set includes a single tempered glass mask with silicone skirting and adjustable straps. Open heeled longer fins and classic J shaped snorkel with purge valve and splash guard. Very comfortable and fins can be worn with boots or snorkeling socks. Ivation Diving gear set has a double glass 2 piece lens that withstands scratches and deep water pressures. Snorkel has silicone mouthpiece for mobility to fit your mouth and full dry top to prevent water from entering your snorkel. Open heeled fins with long sole plate for power and relief of foot strain. US Divers gear set gets you more for your money. If you are an avid snorkeler this is the set for you. High quality products with an durable carrying bag for extras to. Great deal with open heeled fins, 4 pain tempered glass, and silicone snorkel for durability and protection. US Divers gear set comes in a wide range of colors to fit your needs and style. The open heeled short fins allow you to maneuver easily in the water without hitting your buddy or coral. Single tempered glass mask and purge valve in the snorkel for easy snorkeling. 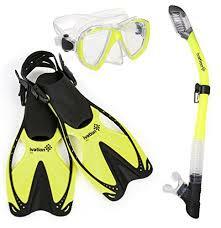 Cressi Rondinella full snorkel gear set come in yellow or blue. Single tempered glass mask with silicone skirt. Closed heel fins for comfort and style. If you were a snorkel sock or thin boot, account for the sizing and go one or two sizes up. Atomic Aquatics long split fins is where you notice the difference in price and quality. The open heeled fins are the best quality and easier on joints of the knees, hips and back. If you snorkel frequently you will notice the difference with this pair. Deep See snorkeling set with split fins and open heels offers a similar set to the Atomic gear but considerably cheaper. Obviously the quality is different but still a great set for the price with split fins. Available in many colors for your specific style. SealBuddy has a 4 window panoramic adult diving mask, enhanced concave nose piece. It has 100% hypoallergenic silicone face skirt with easy to tighten and loosen buckles. Great carrying case that is durable and breathable so your gear won't mold. Great value and comes in many colors. One of the most import items on the list. If you can't see or the mask keeps filling up with water you mid as well be on the boat looking down. There are so many different types of masks that you want to make sure you have the right fit for you. Make sure that the lens is glass and not plastic. The plastic lenses don't offer a great view and scratch easily and make it harder to see under water with different glares coming at different angles. You need to make sure the skirt is silicone and not PVC. This will provide a smooth comfortable seal between the mask and your face. The PVC skirting is a cheaper less pliable material that often leaks more than silicone. Over the past few years there has been a huge development of new masks. It went from goggles, just for swimming then with advancements the mask now covers your nose so you don't have to worry about water going into your nose while you try and breathe through your mouth into the snorkel. Now there are full face masks that cover your nose and mouth so you can breathe from either making it a more comfortable session in the water. The snorkel is attached and comes up through your forehead. We have had great reviews on these items such as the Seaview 180 degree panoramic snorkel mask, though does not come in a full set, still a viable option for those first timers. Just like every other piece of equipment when snorkeling is comfort. There are not too many different materials that could alter issues such as different skirting or what kind of material but you want to make sure that the mouth piece fits correctly in your mouth while being attached to your snorkel mask. Sometimes the mouth piece will fit right but then once it is attached to your mask it can get really uncomfortable and sometimes even cut your mouth up. Once you get a snorkel that fits the main difference will be additional features that come with them. Your basic snorkel will be J-shaped, meaning it is a open tube above your head that turns into a mouth piece in which you can breathe in and out of. To get more advanced snorkels now have what is called a splash guard option, in which is a flap that covers the top of the snorkel preventing salt water from entering the snorkel so you do not get water in your mouth. It also stays closed when you are duck diving (swimming underneath the surface of the water while holding your breathe) to prevent water from entering your mouth. Some better snorkels also have a purge valve for easy draining. This meaning that if water does get through the splash guard or if you don't have a splash guard, this feature allows for water to drain through the bottom of the snorkel without having to blow out through your mouth into the snorkel to clear the water out. Although not necessary, snorkel fins make snorkeling a whole lot easier and more enjoyable. Fins allow you to move through the water with ease and get to deeper parts of the water more comfortably with less effort. Fins come in a variety of sizes and types such as open heel fins which allow for socks and boots if it is colder and closed heel which allows for smaller socks or bare feet. Short fins and long fins which still offer much debate and split fins and flat fins also running into the same issue. Open heel fins allow for more freedom and in some cases easier to get in and out of. They come in straps that may have a clasp for easy access on and off. You can wear water socks or neoprene boots with these to prevent in blisters if you are prone to this or you have a boney foot. Closed heeled fins offer less gear to travel with and in warmer climates which you will most likely be in, you don't need extra warmth from the socks or boots. When fitting closed heel fins you want to make sure that they fit comfortably and remember that when you are in the water they will loosed up slightly. However, if this does become the case you can always buy a small neoprene sock or even just use your regular socks if these is nothing else available to you. On to long fins versus short fins. The difference between the two are the short fins primarily make travel easier but also for the people who associate themselves as beginners it makes it easier to kick in the water even though you are not moving as fast. If you are swimming in a close area it makes it less chance you will run or kick into the reef or surrounding areas. For the longer fins because they have a longer leaver length it may feel as though you are using more energy and you are but you are getting more power and making your movements more efficient in the water. Now we get into Split fins versus paddle fins. Split fins as you can see are shaped quite differently. There is a long slit down the end of the fin towards your foot which allows water to pass through the fin during each kick rotation. This creates an easier glide throughout the movement. As the split fins are easier to kick with, this may provide more comfortable with people having joint pain throughout the back, hips, knees, ankles or any other lower extremity throughout the body. Paddle fins come in short and long sizes offering different movement patterns. With the closed in fins there is no slit down the middle so no water can go through creating more force in the water making it a bit harder to kick but offers more power in the water. The short fins are excellent for beginners so that you still get that extra push but in tight corners there is less likely to kick coral or the surrounding area you are in. The longer fins are great for more distance as you have a longer leaver which will propel you faster in the water. If you snorkeled before and are comfortable in the water the paddle fins will be give you more power per stroke and quickness to get out of different situations. The U.S. divers Adult combination set comes with everything you see here. The mask is a 2 window mask allowing for individual lenses for better clarity in the water. It has adjustable straps that swivel for your comfort on your face. It has 100% silicone skirting allowing for the mask to form to your face. The snorkel has a splash top to prevent water from sliding into your mouth with you are in the water and closes automatically when you are swimming to deeper depths. The plastic snorkel allows for a rigid more straight up form when you are in the water for less chance that the snorkel will bend into the water such as rubber ones. The silicone mouth piece gives mobility to your mouth and plastic purge valve makes it easier to release excess water in the snorkel. The closed heel, open toed fins make fitting easier than ever. The rubber heel prevents your normal chafing of the heel and sides of your feet but the durability to withstand years of enjoyment. If you normally wear smaller neoprene snorkel socks I would recommend a size bigger to accommodate. With 70 years of experience it's hard not to believe it is the number one brand in snorkeling. The single glass lens allows for clarity and perfection when you are looking out into the sea. The unobstructed view makes putting them on a breeze without pressure points in the water. The easy release clip around the mask makes it easy to tighten and sync up where you are at. The wide strap makes it more comfortable around your head reducing pressure points that a small single strap has. The closed heel open toed design makes it easy to put your fit in and out no matter where you are. From the rough seas or crystal calm oceans there won't be any issues. The long fin allows for maximum kicking velocity so you can move efficiently throughout the water especially if a strong current comes, it will be no match for your fins. The blade stability optimizes performance for any water condition or swim. The snorkel is your classic J-shape design with splash guard and purge valve makes breathing as easy as if you were on land. The pliable coil design by the mouth piece makes it easier for the mouth piece to sit comfortably in your mouth opposed to the ridged plastic design with no mobility. The lightweight mesh bag makes it easy to transport your snorkeling gear where ever you are. The Deep blue gear is one of our favorites with the Maui mask having its low volume contemporary design it allows for a wider peripheral view enhancing your snorkeling adventure. The easy adjustable straps make the silicone skirting sits comfortably on your face preventing leaks. With a variety of colors to choose from in mask style such as black, yellow, blue, red, orange it offers a sleek look in or out of the water. The plastic snorkel makes breathing effortlessly with the splash guard and purge valve at the bottom. The silicone mobility of the mouth piece and lower half of the snorkel make it as if you didn't even realize you had something in your mouth. The open heel design on the fins makes putting them on effortlessly whether you have boots, socks, or water shoes on. The open heel makes life a bit easier if the water is a bit colder you can have the warmth of the feet with boots or water shoes on and if you get hot, it is simple to take them off even in the water with the quick release straps. And finally the best carrying bag yet. Not just a mesh bag with little to offer but a fully enclosed carrying case with shoulder strap and handle. You can fit all of your gear in along with anti-fog, water boots and many other useful trinkets that you may need. The US Divers Diva is specifically designed for women with style. With colors ranging from coral to arctic blue this is an absolute must. Being a little more expensive you get what you pay for in quality. You get the Admiral LX mask, Island Dry LX snorkel, Trek Fin and matching color case so you don't end up with your friends gear. The mask has superior hypoallergenic silicone skirt that fits comfortably to your face and won't leave you with a rash or red marks. The pinch and pull pro glide buckles make the straps easy to tighten and loosen. The single low profile lens makes it easier to see under the water and gives you a better peripheral view. The tube has pivot dry snorkel technology in which closes to seal out water when you submerge and opens when you are on the surface. The silicone lower half of the snorkel and mouth piece allow for easy movement when you are playing in the water. The mouth piece is hypoallergenic as well for your comfort and protection. The dual composite fin gives you power in the water to make it easier to enjoy yourself. The open heel design ensures you get the right fit for your foot. The adjustable clip makes it easy to take off and put on. With the open toe design and short fin you can maneuver in the water like a fish, making sure you don't accidentally wreck the coral or reef around you. The fully enclosed bag comes with a carry strap and extra room for your goodies. The whole set comes with a 2 year manufactures warranty so you cannot loose with this product! Are you ready to go faster, longer and effortlessly while you snorkel than this is the set for you. Aquarena stands behind every product they manufacture with a lifetime free replacement guarantee. You cannot go wrong with this product as it is the highest quality materials it's a must. From the first time user to seasoned veteran you need to have this set. The one piece tempered glass makes vision flawless when looking under the sea. With easy release straps that go from a single loop to two around your head you can put in on with ease and not get your hair tangled in it. This allows for an even press along the silicone skirt for your face. The splash guard and purge valve make breathing under water simple and comfortable. If the thought of having your face in water is a little daunting, the silicone mouth piece can relax in your mouth and keep your mind at ease. The open heel fin and extra long fins make it simple put on and take off. You will be gliding with ease with these fins. With a boot or water shoe or even sock, there is nothing this set cannot do. Make the fin form to your foot and enjoy the water. The nylon mesh bag is sleek with a quick tie draw string so you can get your equipment in and out and have a little extra room for others if need be. This is my absolute favorite and you cannot lose out with the guarantee. Highly recommended!